What Are the "Right" Responsibilities for HR? HR’s role and plate of responsibilities have evolved through the years in response to the economic time-period and the changing views to jobs, work processes, and organizational structures. Traditionally focused on administrative personnel management, HR now owns everything from job design and recruitment to training/development and industry relations. While this increase in responsibilities may mean an increase in importance, a larger workload is a challenge, especially when business leaders demand HR to be more efficient and provide higher value insights. 1. Which responsibilities fall under HR in your organization? 2. Which responsibilities should HR continue to own? 3. Which responsibilities should be taken off HR’s plate? The chart below illustrates the variety of activities that fall under HR, according to approximately 220 HR and business professionals. Overall, the majority of respondents marked 17 out of the 19 responsibilities as ones that belong to HR in their organizations. The majority of respondents say their HR department is responsible for everything from internship programs, to benefits management, to termination. Although there are third parties in the market that provide services such as recruiting, benefits management, and payroll, it appears that organizations are opting to keep these responsibilities internal. Diversity management, resource planning, and compliance are also common responsibilities of HR, with over 60% of respondents identifying them as HR tasks. Both diversity management and resource planning are more recent developments in HR that are quickly gaining importance in this global work environment. Government relations and work systems, on the other hand, are less common; less than 50% of respondents say these activities fall under HR in their organization. 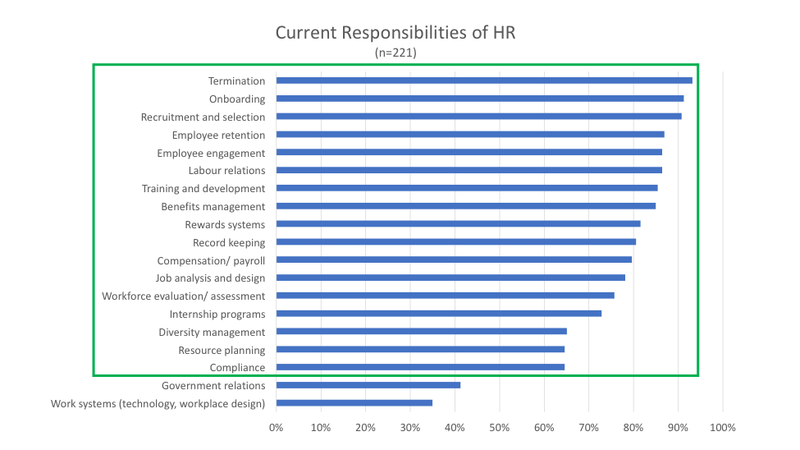 When asked about which responsibilities to keep in HR, it appears that respondents want to hold on to everything they are currently doing. Clear exceptions are record keeping and compliance, two traditional tasks of HR. Record keeping, in particular, is something over 80% of respondents are doing, but only 50% want to keep. This is not a surprise since record keeping is a basic administrative activity that provides little strategic value. More than 80% of respondents indicated training and development, recruitment and selection, and employee engagement as responsibilities to keep in HR. These tasks, all centered on the talent lifecycle, reveal that employees want to stay true to HR and remain connected to personnel. This narrowing focus in HR is a response to the competitive nature of the talent market and the need for HR to be people experts for their organizations. Peripheral activities such as compensation/payroll, recording keeping, and compliance, on the other hand, are ones that fewer respondents want to hold on to. When looking at the full plate of responsibilities, approximately 50% or more of respondents want to keep everything as opposed to cherry picking the activities they think HR should focus on. This begs the question: are respondents thinking strategically for the future of HR, or do they merely want to keep their own responsibilities within HR for job security? Seeing how the two charts are almost identical, the latter may be closer to the truth. However, it could very well be that HR professionals do not know which activities fall in the strategic category. Even more, maybe HR professionals do not feel they have the option within their organization to reallocate their plate of responsibilities without fear of losing their jobs. Addressing these two issues require education as well as the support and participation of business leaders. The least common responsibilities that HR currently oversees (work systems, government relations, and compliance) are in the top four responsibilities that respondents want to remove from their plate. Government relations was the least popular at 45%, and work systems came in second at 38%. It’s interesting that these two are at the top of the list since less than 40% of respondents say these tasks fall on their current plate of responsibilities. It appears that all respondents who are currently doing these tasks want to get rid of them. Although a dislike for government relations can be brushed aside, a dislike for technology should be addressed since HR needs to leverage technology to evolve its role. If HR wants to be more strategic and less administrative, it needs to delegate more to systems. Work systems can manage data, provide analytics, and streamline processes, freeing up HR to focus on more strategic endeavors. Assuming that HR professionals are aware of the capabilities of HR platforms, why are they interested in moving technology off their plate? It could be that employees simply do not have the technical skills to administer the systems and are frustrated by the time it takes to manage the tools. If this is the case, organizations should consider having IT own these systems and work closely with HR to provide the capabilities HR needs. They should also ensure that employees who work in the systems receive sufficient training to not only operate but leverage the systems to improve their work. When employees understand how to properly use the systems, companies will more likely reap the benefits of their investment. What HR should focus on going forward is an important conversation that HR professionals and their business counterparts should have. It is clear that a myriad of responsibilities falls on HR’s plate. What isn’t clear, however, is which activities have a higher value for the organization. Although HR professionals are pushing to focus more on talent management, they are still juggling all their other responsibilities. How much energy are they actually giving to talent management if they have to spread their attention across all the tasks? Before putting more demands on HR’s plate, business leaders should think about their business strategy and what they need from HR. If what they expect is something different from what the department currently offers, evolving HR’s role should come with an evolution of HR’s responsibilities. As opposed to keeping everything internal, putting more on HR’s plate, and demanding they provide higher value insights, consider leveraging technology and external resources to elevate HR’s capabilities. Similar to Finance and Marketing in previous years, HR, as a department, needs to update its role and responsibilities to reflect not only the demands of the digital age, but the technological advancements available in the market. Instead of holding on to everything they are currently doing, HR professionals should ask themselves: what higher value work can I provide to my organization given the availability of technology and tools? Only through elevating their work can they truly move their department forward.